The film biography of gay rights activist Harvey Milk is an inspirational story of one man's courage, strength and tenacity in the face of seemingly overwhelming forces. Picking up the story when Harvey turns 40 years old having achieved nothing in life, Milk recounts the years between 1970, when Harvey moved from New York to San Francisco, and 1978, when he was assassinated along with the Mayor at City Hall. Upon arrival in San Francisco Harvey and his partner Scott Smith (James Franco) settle in the Castro neighbourhood, which quickly morphs into the magnetic focal point of gays from around the world. Harvey's outspokenness for gay rights and the rights of all minorities soon elevates him to the status of unofficial mayor of Castro, and he gathers around him a group of dedicated activists. He also meets and mentors Cleve Jones (Emile Hirsch), who would go on to become a prominent campaigner for the rights of AIDS victims. Harvey takes a run at public office on several occasions, and repeatedly fails to get elected; the constant electioneering takes its toll on his private life, and Smith leaves him. Anti-gay sentiment is meanwhile sweeping across America, with local laws protecting the rights of gays being defeated in many jurisdictions. 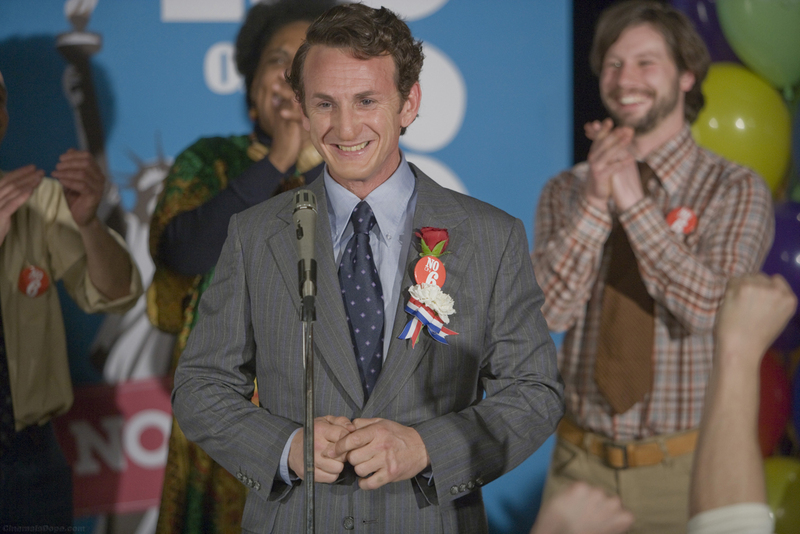 In 1977 Harvey finally wins a seat as a San Francisco Supervisor, and becomes the first openly gay man elected to public office in the United States. In the last year of his life, Harvey Milk faces his three biggest battles: Proposition 6 is on the California ballot, and if passed it will force the firing of all gay teachers in the state; Harvey's partner Jack is becoming increasingly unstable and difficult to manage; and Supervisor Jack White is a political rival who becomes ever more erratic. One of these challenges ends in a great triumph: the other two in utmost tragedy. Sean Penn delivers a tour-de-force performance as Harvey Milk, capturing a man publicly confident about his position in life, embracing the leadership role that history selected for him, while privately tortured by the consequences of failure. Through the struggles of Harvey's life director Gus Van Sant seamlessly presents the broader story of the early battles that gays had to fight to gain equality and basic human rights. It's an eye-opening, sometimes sickening tale of wide-scale high-level fear-mongering, abuse and dehumanization taking place in a supposedly enlightened United States. Missing from Milk is any meaningful portrayal of the first 40 years of Harvey's life. We just gets his assertion that he achieved nothing to that point. Some understanding of his upbringing and the events that shaped him into the man that he became would have provided better character rounding. The chronicle of Harvey Milk is ultimately the story of those rare men who embrace a unique role to define and shape the course of history through peaceful means against impossible odds, often at great personal cost. In an age when seeking instant personal gratification is the rule and violence is celebrated, it is a tale not told often enough.